French lentils prepared like this. (Start with one cup dried, and use them all when they’re cooked!) Drain them well and save the cooking broth for soup or sauce. First make the crust. In a large bowl combine the flour, salt and pepper. Grate in the butter, mixing with a fork as you go. You should have a coarse and crumbly consistency. Mix in just enough ice water to make a workable dough. Knead very briefly to ensure that everything is incorporated, form into a flat disc, and wrap in foil. Chill in the fridge for at least half an hour. Meanwhile…preheat the oven to 425. Cut the butternut squash in half lengthwise, scoop out the seeds, and place it face down on a small baking sheet covered in foil. Roast until it’s browned and caramelized and soft inside, 30 – 40 minutes depending on its size. Set aside to cool. Wrap up half the squash for use in another recipe, and scoop the soft flesh out of the other half. Warm the olive oil in a large skillet over medium heat. Add the garlic, stir and fry for about a minute, add the tomato paste. Stir until you have a thick sauce. Add the roasted squash flesh. Break it up with your spoon and stir it into the mix. Add a few tablespoonfuls of water, the chard, the smoked paprika, nutmeg and rosemary. Stir to combine everything. Cover and cook for 4 or 5 minutes until the chard is wilted but still bright. Remove the lid and cook till the pan is fairly dry, a few more minutes. Set aside to cool. In a food processor whiz the eggs until they’re light and fluffy. Add the nuts, and process again until they’re fairly well ground and you have a smoothish batter. A bit of nutty texture is fine, so don’t worry about getting it completely silky. Add the cheeses and process again. Add the chard and squash mixture, and process to combine and chop slightly. You want flecks of green, so don’t process until completely smooth. Transfer to a bowl, stir in the lentils and season well with salt and pepper. Preheat the oven to 425 again. Break the dough into two pieces, with one being about 3/4 of the total. Butter and flour a large tart pan or cake tin. Roll the dough to fit over the pan, and press it in to the corners and up the sides, leaving a little bit extra all the way around. Don’t worry about making it a perfect circle, but be sure to cover the whole pan. Pile the filling inside the crust. Press the halved tomatoes into the filling in a circle, with one or two in the middle. Roll out the remainder of the crust and fit it over the top. Press the edges of the top and bottom crusts together and roll them down to seal them. Press with tines of a fork to be sure that the edges are sealed. 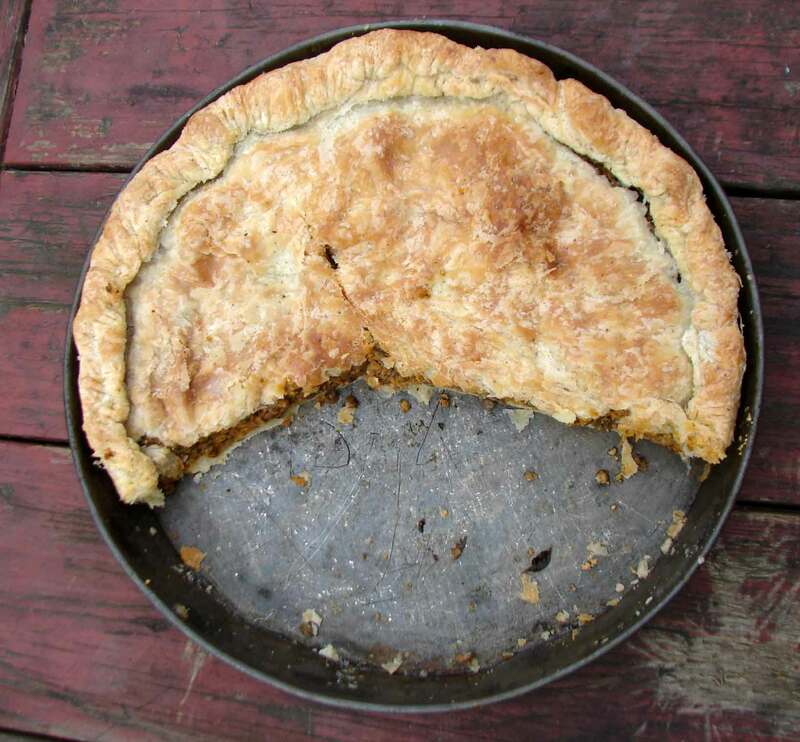 Poke the top of the pie in a few places. Bake until puffed and dark golden brown, around 35 minutes. Let cool slightly, then slice and serve. 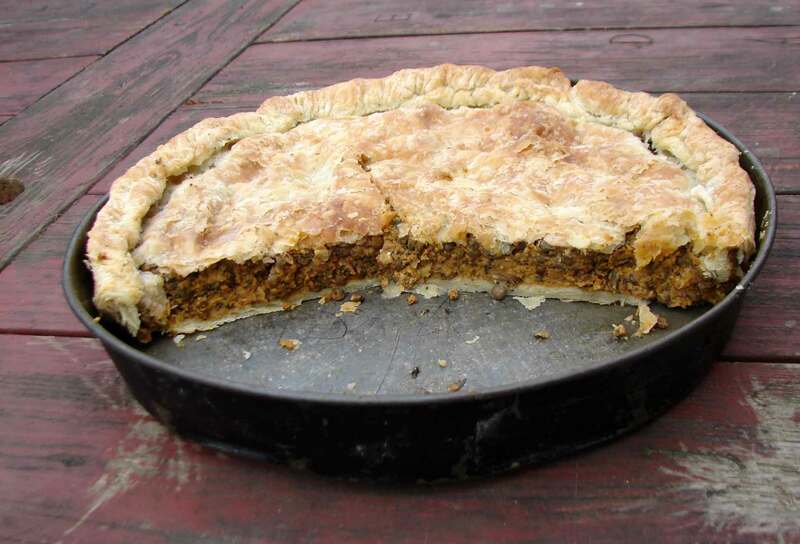 This entry was posted in basic pie filling, crust, lentil, pie, recipe and tagged flaky crust, french lentils, roasted butternut squash, vegetarian holiday meal, vegetarian pie by Claire. Bookmark the permalink.